Drought conditions greatly reduce the available forage for livestock. They also impact forage and rangeland production across the state. Short and long-term ramifications will continue to affect the management of livestock. Livestock have been sold or relocated out of state in record numbers; however, there are alternatives for the remaining population. Treat low-quality roughages with various feed additives. Additives can improve palatability and feeding quality. (Brownson, 1996). Substitute 1 pound of grain or other concentrate feed for 2 pounds of alfalfa hay or 3 pounds of grass hay. Do not exceed grain feeding by 0.4 percent of the live body weight when forage is the major component of the diet. Grain is not always practical to feed, but there are ways to feed it even in pasture or rangeland situations. Many producers use barrels, gated pipe split in half, bunks, or old hog feeders mounted on a trailer. Other management options can be found at www.ext.colostate.edu/drought/altfeed.html. Relocating the cowherd into drylot is a management alterative that may allow producers to take advantage of grains and byproduct feeds (Wright, 2002). Diets for drylot cows are formulated to meet the nutrient requirements of the cows while minimizing feed costs. As a result, intake is generally limited, and more concentrate feeds are included to cheapen the diets. Since intake on concentrate diets is restricted, cattle may appear gaunt and behave as though hungry. After 14 to 21 days, they will adapt to the reduction in feed intake, but they may continue to appear gaunt. 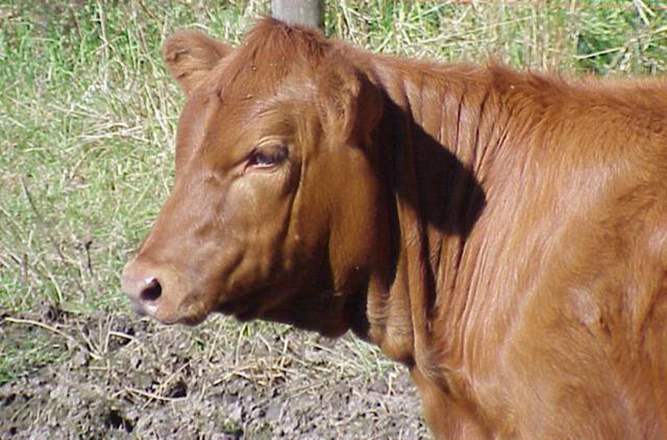 Cattle should adapt to high-grain diets in seven to 10 days and should be observed closely during that time. A minimal amount of roughage is required to maintain rumen function. As a rule of thumb, cows should receive at least 0.5 percent of their body weight as roughage (90 percent dry matter basis). Thus, a 1,200-pound cow should receive at least 6 pounds of roughage per day.